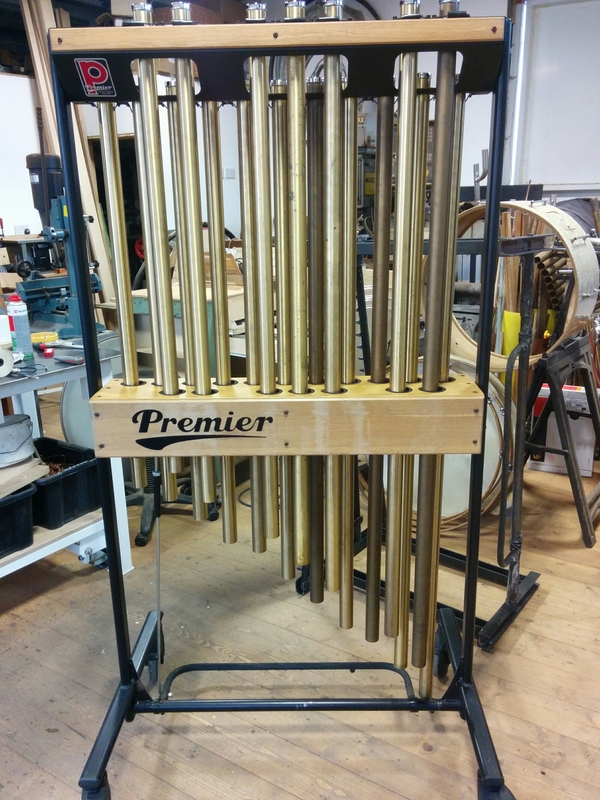 Premier tubular bells, in good condition now sold. 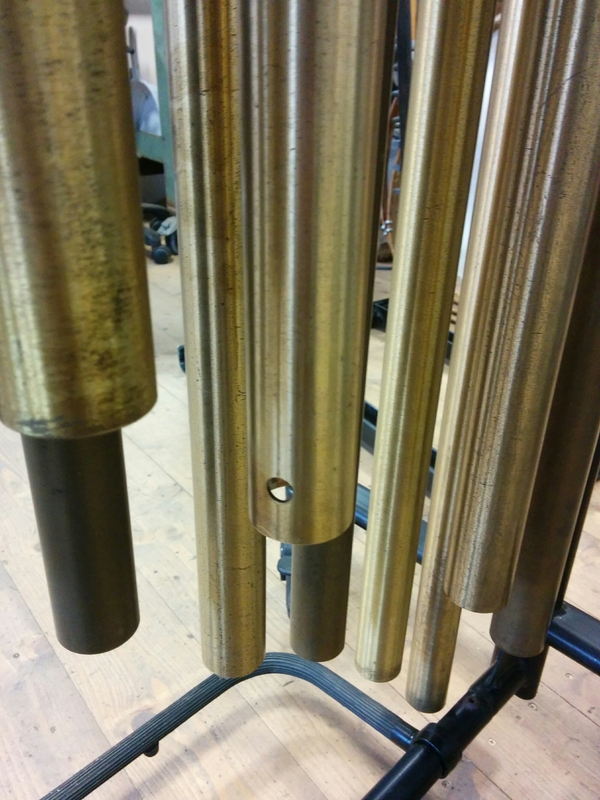 The problem with the brass finished tubes is that they discolour over time, but they can be linished with fine wet and dry paper (I use 400 grit) and they will come up like new. The frame is in good condition on the whole. There are a few minor splits in the oak panels, but they are very minor and don’t affect the instrument structurally. The damper vane on this range of Premier bells is a return to the original design of a sliding mid gate, as opposed to a rotating vane. 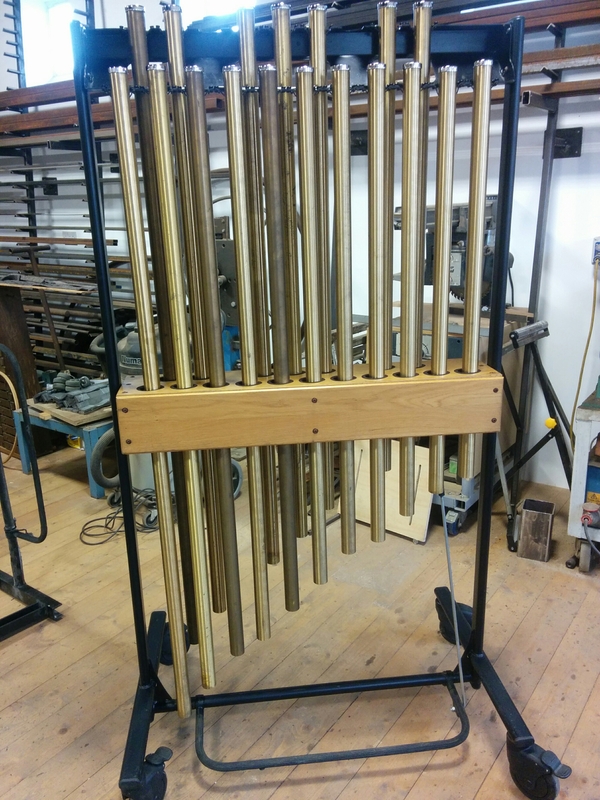 The latter is a board that rotates between the two rows of bells. The sliding mid gate is simply another board with holes in it that moves from side to side in the instrument and pinches the bells. It is more reliable that the vane, as long as the holes are in the right place – one of which is not, so the low F is not damping. Again this is something that can be easily corrected. The low F# was split at the cap. These tubes are no longer made due to changes in EU legislation, so the only option I had was to invert the tube, repair the split and retune it. The pitches of the bells were all over the place, now they have all been tuned. So the set complete with a cover is ready for use. As usual, any questions feel free to ask.